Charlie Adam and Andy Carroll were on the scoresheet as Liverpool extended their unbeaten run of games to seven with a comfortable win over West Brom. The Baggies failed to match their opponents throughout the game and went behind to an early Adam penalty when Luis Suarez was tripped. Carroll scored just before half-time when he was put through by Suarez's pass following Jonas Olsson's error. Somen Tchoyi had the hosts' best chances but they were well beaten. A shot past the post from the Cameroonian striker - a stand-in for the injured Shane Long - just after the break represented one of West Brom's few meaningful efforts. Liverpool were crisp in their passing and willing to make more supporting runs from the beginning of the game, and at times they outclassed their opponents. Kenny Dalglish's side, who were without Steven Gerrard with an ankle infection and Jamie Carragher with a calf strain, were also quicker to the loose ball. While West Brom seemed to sit too deep, allowing Adam and his team-mates time to switch play with relative ease. West Brom's defending will have disappointed boss Roy Hodgson, whose sides usually pride themselves on hard work and organisation. And they did not make any significant inroads in attack as Liverpool climbed to fifth in the Premier League. The visitors were handed an early gift when Jerome Thomas brought down Suarez for a ninth-minute penalty. West Brom's supporters were furious with what was a debatable decision, made by assistant referee Gary Beswick, but Adam made no mistake from 12 yards. Referee Lee Mason was continually booed thereafter, but the frustration of the home fans should have been directed towards their team, who were second best and did not create their first real opening until after 40 minutes when Peter Odemwingie could not reach Tchoyi's cross. They failed to harry the Liverpool defence and Suarez and Carroll had chances to add to their total before they doubled the lead. Olsson gave the ball away straight from a free-kick and once it was swept to Suarez on the right, the Uruguayan found his unmarked striker partner Carroll, who, after a heavy first touch, tucked in left-footed past the advancing Ben Foster with his second. 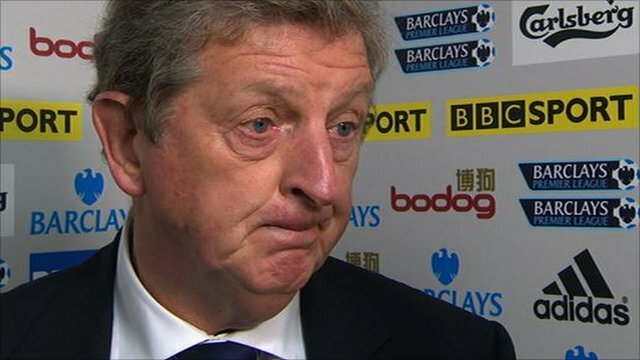 Throughout the first period Hodgson grew ever more angry, at one point throwing his coat off in disgust, but his side started the second half better with Tchoyi screwing a shot wide of Pepe Reina's right-hand post. That proved only a brief interlude, though, and Suarez was continually released on the break by Adam to cause more havoc. Olsson made a superb block to deny Liverpool's top scorer, and Foster saved well from Jose Enrique and Carroll as the visitors poured forward. Stewart Downing could have made it 3-0 when he hit a post late on and that scoreline would not have been an unfair reflection on Liverpool's accomplished display. West Brom boss Roy Hodgson on the penalty decision: "I think the 25,000 people watching, even the Liverpool supporters, will probably agree with me that it looked like a very, very harsh decision and there was certainly no intention to foul the player or give away a penalty. "I don't think we played well enough in the first half to cause them problems and we were better in the second half, but by that stage we conceded on the counterattack in the 46th minute so probably the crucial mistake in that game was that one." 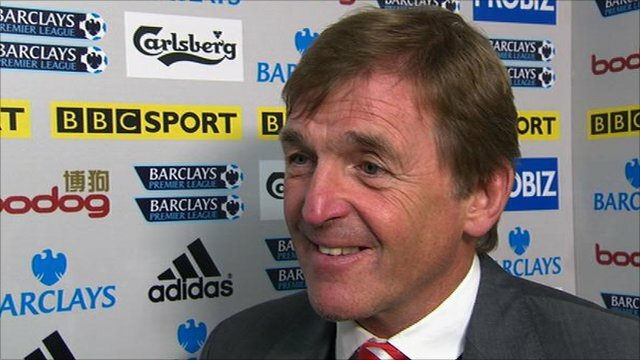 Liverpool manager Kenny Dalglish: "I don't want to take anything away from the players. They played really well against a team who themselves have been doing well recently. "They made an awful lot of chances today and got two goals as a reward from it. I think they deserve the victory, they played really well, and the approach and attitude towards the game and each other was important." 90:00+2:23 The referee blows for offside against Andy Carroll. Free kick taken by Ben Foster. 90:00+1:06 Free kick awarded for a foul by Jerome Thomas on Glen Johnson. Indirect free kick taken by Glen Johnson. 89:51 Stewart Downing has an effort at goal from the just inside the area hitting the post. 88:53 Graham Dorrans takes a shot. Daniel Agger gets a block in. Jerome Thomas takes a inswinging corner. 86:13 Free kick awarded for a foul by Glen Johnson on Jerome Thomas. Direct free kick taken by Graham Dorrans. Correction - 85:15 Leiva Lucas gives away a free kick for an unfair challenge on Graham Dorrans. Direct strike on goal from the free kick comes in from Graham Dorrans. 85:15 Leiva Lucas gives away a free kick for an unfair challenge on Graham Dorrans. Indirect free kick taken by Graham Dorrans. 83:32 Jerome Thomas sends in a cross. 82:17 Inswinging corner taken from the right by-line by Chris Brunt, Header from deep inside the area by Jonas Olsson goes harmlessly over the crossbar. 82:06 The ball is delivered by James Morrison. 80:51 Substitution Luis Suarez leaves the field to be replaced by Craig Bellamy. 78:21 Luis Suarez is caught offside. Indirect free kick taken by Jonas Olsson. 77:39 Peter Odemwingie is flagged offside by the assistant referee. Jose Reina takes the indirect free kick. 75:47 Free kick awarded for a foul by Jordan Henderson on Jerome Thomas. Direct free kick taken by Graham Dorrans. 75:26 The referee blows for offside against Luis Suarez. Indirect free kick taken by Ben Foster. 74:51 Peter Odemwingie concedes a free kick for a foul on Daniel Agger. Free kick taken by Jose Reina. 74:33 The official flags Stewart Downing offside. Ben Foster takes the free kick. 73:56 Effort from the edge of the area by Andy Carroll goes wide of the left-hand upright. 72:36 The ball is crossed by Andy Carroll, save by Ben Foster. 70:01 Indirect free kick taken by Martin Skrtel. 70:01 Substitution (West Brom) makes a substitution, with Simon Cox coming on for Somen Tchoyi. 70:01 The official flags Peter Odemwingie offside. 69:23 Sanchez Jose Enrique delivers the ball, Billy Jones makes a clearance. 69:04 Outswinging corner taken left-footed by Stewart Downing from the left by-line. 68:51 Andy Carroll takes a shot. Save by Ben Foster. 68:07 Steven Reid takes a shot. Save made by Jose Reina. 67:03 Chris Brunt takes a shot. Daniel Agger gets a block in. 66:44 Corner taken by Graham Dorrans from the left by-line played to the near post, Daniel Agger manages to make a clearance. 66:35 The ball is sent over by Billy Jones, clearance made by Glen Johnson. 64:45 Corner taken left-footed by Charlie Adam from the right by-line, Stewart Downing produces a left-footed shot from the edge of the box and misses to the right of the goal. 64:26 Sanchez Jose Enrique takes a shot. Ben Foster makes a save. 63:07 Centre by Somen Tchoyi. 61:43 Ben Foster takes the indirect free kick. 61:43 Substitution Graham Dorrans joins the action as a substitute, replacing Youssouf Mulumbu. 61:43 The offside flag is raised against Stewart Downing. 60:54 Corner taken by Stewart Downing, Steven Reid makes a clearance. 60:49 Sanchez Jose Enrique produces a cross, Gareth McAuley manages to make a clearance. 60:26 Chris Brunt concedes a free kick for a foul on Stewart Downing. Charlie Adam takes the free kick. 58:33 Luis Suarez is caught offside. Ben Foster takes the free kick. 58:12 Jonas Olsson delivers the ball, Jose Reina makes a save. 57:26 Substitution James Morrison is brought on as a substitute for Paul Scharner. 57:09 Effort on goal by Luis Suarez from just inside the penalty box goes harmlessly over the target. 56:53 Centre by Sanchez Jose Enrique, Shot by Luis Suarez from 18 yards. Blocked by Jonas Olsson. 54:20 The ball is swung over by Jordan Henderson, clearance made by Gareth McAuley. 53:33 Luis Suarez produces a left-footed shot from inside the area that goes over the bar. 53:12 Sanchez Jose Enrique crosses the ball, blocked by Steven Reid. 52:47 Steven Reid sends in a cross. 52:29 Jerome Thomas delivers the ball. 51:52 The assistant referee flags for offside against Andy Carroll. Ben Foster restarts play with the free kick. 48:59 Charlie Adam takes a shot. Jonas Olsson gets a block in. 46:34 Effort from the edge of the box by Somen Tchoyi goes wide of the left-hand post. 45:40 Luis Suarez produces a cross, Jordan Henderson produces a left-footed shot from the edge of the box and misses to the left of the goal. 45:08 Chris Brunt produces a cross, clearance made by Daniel Agger. 45:00+2:21 The match has reached half-time. 45:00+0:13 Luis Suarez provided the assist for the goal. 45:00+0:13 GOAL - Andy Carroll:West Brom 0 - 2 Liverpool A goal is scored by Andy Carroll from inside the penalty area to the bottom right corner of the goal. West Brom 0-2 Liverpool. 44:50 The ball is sent over by Steven Reid, clearance made by Daniel Agger. 44:43 The ball is delivered by Jerome Thomas, Sanchez Jose Enrique manages to make a clearance. 43:50 Free kick awarded for a foul by Luis Suarez on Jerome Thomas. Indirect free kick taken by Jonas Olsson. 43:25 Jerome Thomas crosses the ball, save by Jose Reina. 42:26 Centre by Charlie Adam, Andy Carroll takes a shot. Save made by Ben Foster. 42:04 Centre by Stewart Downing, clearance by Jonas Olsson. 40:17 Chris Brunt produces a cross. 39:47 Youssouf Mulumbu has a drilled shot. Blocked by Martin Skrtel. 39:22 The ball is sent over by Somen Tchoyi, Paul Scharner takes a shot. Daniel Agger gets a block in. 38:44 Free kick awarded for a foul by Jerome Thomas on Leiva Lucas. Glen Johnson restarts play with the free kick. 37:23 Stewart Downing delivers the ball. 34:59 Inswinging corner taken left-footed by Charlie Adam, Effort on goal by Luis Suarez from inside the area goes harmlessly over the bar. 34:21 Free kick crossed by Charlie Adam, clearance made by Jonas Olsson. 34:21 Booking The referee shows Jonas Olsson a yellow card. 34:16 Free kick awarded for an unfair challenge on Andy Carroll by Jonas Olsson. 34:04 The ball is delivered by Jordan Henderson, Ben Foster makes a save. 33:40 Jordan Henderson takes a inswinging corner to the near post, save by Ben Foster. 33:30 Centre by Stewart Downing, blocked by Gareth McAuley. 31:26 Free kick awarded for a foul by Luis Suarez on Gareth McAuley. Ben Foster takes the free kick. 29:50 Youssouf Mulumbu challenges Leiva Lucas unfairly and gives away a free kick. Luis Suarez has a direct shot on goal from the free kick. 29:41 Centre by Luis Suarez, Paul Scharner manages to make a clearance. 29:25 The ball is crossed by Sanchez Jose Enrique. 29:09 Outswinging corner taken from the left by-line by Luis Suarez. 28:41 Corner taken by Charlie Adam, save by Ben Foster. 28:33 The ball is delivered by Glen Johnson, clearance by Jonas Olsson. 26:55 Unfair challenge on Jordan Henderson by Billy Jones results in a free kick. Jose Reina takes the free kick. 26:31 A cross is delivered by Somen Tchoyi, clearance made by Martin Skrtel. 24:42 Peter Odemwingie challenges Daniel Agger unfairly and gives away a free kick. Free kick taken by Sanchez Jose Enrique. 24:23 The ball is delivered by Glen Johnson, save made by Ben Foster. 22:10 Luis Suarez crosses the ball, Andy Carroll takes a shot. Outswinging corner taken left-footed by Stewart Downing, Jonas Olsson manages to make a clearance. The referee blows for offside. Sanchez Jose Enrique takes the indirect free kick. 21:04 Free kick awarded for an unfair challenge on Billy Jones by Glen Johnson. Ben Foster restarts play with the free kick. 20:30 Glen Johnson produces a cross, Jonas Olsson manages to make a clearance. 19:56 A cross is delivered by Billy Jones, Peter Odemwingie takes a shot. Save made by Jose Reina. 18:28 The official flags Glen Johnson offside. Ben Foster takes the indirect free kick. 17:11 Daniel Agger fouled by Somen Tchoyi, the ref awards a free kick. Free kick taken by Jose Reina. 14:49 Gareth McAuley fouled by Andy Carroll, the ref awards a free kick. Free kick taken by Ben Foster. 14:20 Right-footed shot by Jerome Thomas went wide left of the goal. 13:38 Andy Carroll is penalised for handball and concedes a free kick. Gareth McAuley takes the free kick. 11:18 Free kick awarded for an unfair challenge on Gareth McAuley by Andy Carroll. Ben Foster takes the indirect free kick. 11:02 Corner taken left-footed by Charlie Adam from the right by-line to the near post, Jonas Olsson manages to make a clearance. 10:01 Free kick awarded for a foul by Jonas Olsson on Luis Suarez. Free kick crossed by Charlie Adam, clearance by Jonas Olsson. 8:39 Assist by Luis Suarez. 8:39 GOAL - Charlie Adam:West Brom 0 - 1 Liverpool Penalty taken left-footed by Charlie Adam and scored. West Brom 0-1 Liverpool. 7:01 Foul by Jerome Thomas on Luis Suarez, Penalty awarded. 5:31 Chris Brunt delivers the ball, clearance by Charlie Adam. 4:54 Free kick awarded for an unfair challenge on Steven Reid by Charlie Adam. Free kick taken by Chris Brunt. 2:50 Corner taken by Charlie Adam from the left by-line, Headed effort from the edge of the area by Andy Carroll goes wide of the right-hand post. 2:36 The ball is swung over by Glen Johnson, clearance by Steven Reid. 2:16 Steven Reid gives away a free kick for an unfair challenge on Stewart Downing. Charlie Adam takes the free kick. 1:16 Charlie Adam produces a right-footed shot from just outside the area that goes harmlessly over the target.